The goal: 1 article per weekday, broken up into a few tweets. I'll do my best to be brief & funny and inspire you to look up the original. That is not at all as daft as it might sound. Even following a summary of the Summa in this way would be very beneficial; and as the fellow says, it should prompt you to look up the original. There are plenty of sites with an English translation of the Summa. Out of habit, I have always used the New Advent site which is helpfully laid out. @summatheologiae points to a Dominican site with nice printable pdfs of the Summa in the 1920 Dominican translation so you can print out a particular question (or article) to take with you on the train. For those who know Latin, there is the monumental Corpus Thomisticum which has all the works of St Thomas Aquinas in the original Latin, as well as several other useful resources. Posting an article a day on Twitter is a long-term project, of course. I just did a quick estimate assuming an average of 5 articles per question. On that reckoning, it would take over seven years. But someone may have some statistics and be able to tell us exactly how many articles there are. UPDATE: Gregory the Eremite has supplied the information that there are 2669 articles in the Summa which is an average of 5.21 articles per question. I'm rather chuffed that my estimate was quite close! 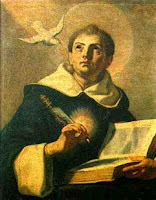 See also Gregory's blog Reading the Summa which is written in support of the York Aquinas Reading Group which is working through the Summa. Gregorian chant - nobody really likes it do they? The most northerly peaches in the world? "Every piece of my flesh ..."
New blog: "Catholicism pure & simple"
Christ, "centre of history and the cosmos"
Ecumenical Diablog says "Don't take the Tablet"